For a while there, it looked like anything to do with penguins would become a license to print money. First 2005’s March of the Penguins grossed $77 million in the US – while that doesn’t sound like a lot, for a cheap little documentary, it was phenomenal. Then 2006’s animated Happy Feet made nearly $200 million despite the fact it wasn’t very good. 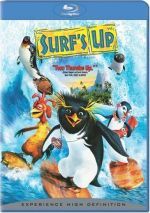 The film introduces us to Cody Maverick (voiced by Shia LaBeouf), a penguin who aspires to follow the role model of the late Zeke “Big Z” Topanga and become a great surfer. As a crew shoots a documentary, we learn why he wants to achieve this goal and also get to know his circumstances. That means we meet his mother Edna (Dana L. Belben) and bullying big brother Glen (Brian Posehn). They give us the idea that most folks don’t accept Cody and his surfing dream. From there we shift to the “10th Big Z Memorial Surf Off”. Tank “The Shredder” Evans (Diedrich Bader) won the last nine, but sea otter surf promoter Reggie Belafonte (James Woods) – via his put-upon sandpiper assistant Mike Abromowitz (Mario Cantone) – seeks the next big thing, a challenger to take on Tank. Guess who he finds? Cody – duh! The kid heads to Pen Gu Island for the competition. Cody also befriends a fellow surfer named Chicken Joe (Jon Heder) and falls in love with lifeguard Lani (Zooey Deschanel). We follow Cody’s arc as he tries to win over Lani and become a champion – as tutored by a mysterious mentor called “The Geek” (Jeff Bridges). Beyond an unusual – for animation – decision to show events as part of a “documentary”, you won’t find anything innovative or surprising here. The film follows the modern animation template almost to a tee. We get the usual wisecracks and borderline risqué humor, all pumped out at a pretty fast pace. There’s also a cast of celebrity actors and a mix of rock songs. Surf’s Up lacks the same level of modern pop culture references that often crop up in these flicks – which is a good thing – but there’s not much else about the film that I can say makes it stand out when compared to its contemporaries. Except for this: it truly is pretty good. Animated movies these days tend to be hit or miss, with more misses than hits in my opinion. Many of the successes tend to be qualified ones, and we find more than a few duds along the way. Really, there are so darned many CG animated movies on the market these days that it’s no wonder we find so many stinkers. So what makes Up more entertaining than most? For one, the paucity of pop culture references comes as a pleasant surprise. No, Up doesn’t totally eliminate these, but it could’ve gone much more wild with them, especially given the sports-related setting. Too often, animated pictures toss out pop references via the random, nonsensical Family Guy model, which means they’re more about recognition than they are humor. I’m pleased that Up avoids that cheap source of attempted comedy. A fine voice cast helps in that domain. With big roles in Disturbia and Transformers as well as Up, it became tough to avoid LaBeouf in 2007. Despite that potential overexposure, LaBeouf remained likable and engaging here. He allows Cody to be a worthy protagonist and avoids turning him into a whiny sap. Bridges is also amusing as the surfing guru, and even the usually annoying Heder becomes charming as the requisite wacky sidekick. While Surf’s Up never threatens to become a classic animated film, it entertains. It sticks within the genre’s usual restrictions but still manages to feel acceptably creative. This is a likable little flick. Surf’s Up appears in an aspect ratio of approximately 1.85:1 on this Blu-ray Disc. Because it used a faux documentary style, it became tough to objectively rate the visuals of Up. That said, the movie looked pretty good most of the time. The photographic choices meant a little softness at times, but those were infrequent and the film largely appeared well-defined. No issues with jagged edges or shimmering occurred, and edge enhancement looked absent. As for source flaws, the film was clean. Some intentional “print defects” did appear – as well as fake grain - but I didn’t count them against the image. Colors seemed positive. The “documentary” presentation made them a little more subdued than usual, but they still came across as pretty lively and dynamic. Blacks were dark and tight, while shadows were less consistent. Again, the documentary impression meant that lighting wasn’t always stellar; the movie appeared to want to give us an “on the fly” look, so shadows could be somewhat thick. Overall, I thought the visuals were good enough for a “B+”. Despite the “on the fly” tone of the visuals, Surf’s Up presented the standard big and impressive Dolby TrueHD 5.1 soundtrack. The documentary feel didn’t affect the audio at all, as the mix presented a good impression. The soundfield always gave us a nice sense of environment, and the big surfing sequences proved exciting. They used all five channels to involve us in a action. Other scenes showed decent spread as well, and music offered solid stereo imaging. How did the Blu-ray compare to the DVD version? Audio showed a little more warmth and pep, while visuals appeared smoother and more natural. This turned into the expected step up in quality. When we head to the set’s extras, we start with two audio commentaries. Also found on the DVD, the first comes from directors Chris Buck and Ash Brannon and producer Chris Jenkins. All three sit together for this running, screen-specific discussion. At the start, we learn why they chose the documentary format and related concerns. The track also looks at cast, characters and performances, animation issues, story and deleted/altered scenes, music, surf research and inspirations, and a few other technical issues. New to the Blu-ray, the second commentary comes from visual effects supervisor Rob Bredow, animation supervisor David Schaub, and layout supervisor James Williams. All three sit together for a running, screen-specific discussion of various animation, cinematographic and visual domains. As expected, technical elements dominate the chat, but the discussion never becomes excessively dry. We learn a lot about the challenges related to the movie’s “documentary” format and get good information about the animation in this useful chat. Four Lost Scenes run a total of five minutes, 24 seconds. We find “Doris and Sheila” (0:53), “Pen-Gu: Island of Adventure” (1:05), “Z Is for Zurfing” (1:10) and “Doris and Sheila: Behind the Scenes” (2:15). The first three come to us via story reels; no finished animation appears. “Doris” is less a deleted scene than it is a look at the recording session with Mindy Sterling and Jane Krakowski, the actors who played cut characters Doris and Sheila. They act out a scene not in the flick, but it doesn’t come as even a story reel; we just watch them perform. Based on the evidence here, it’s too bad Doris and Sheila didn’t make the flick. They were supposed to be Z’s groupies, and their sequences are fun. “Pen-Gu” offers a tacky – and amusing – Reggie Belafonte promotion film, while “Zurfing” shows the cheesy side gigs Reggie made Z take back in the day. All the clips are enjoyable. An odd piece, Arnold’s Zurfinary runs four minutes, 12 seconds. The movie’s young Arnold character teaches us how to speak like a surfer. It’s harmless but not particularly interesting. Some featurettes follow. All Together Now: Surf’s Up Voice Sessions goes for 17 minutes, three seconds as it presents notes from Brannon, Buck, and actors Shia LaBeouf, Jeff Bridges, Zooey Deschanel, Jon Heder, Mario Cantone, Diedrich Bader, Kelly Slater, Rob Machado, Sal Masekela, Dana Belben, Reed Buck, Reese Elowe, and Jack P. Ranjo. They discuss recording the actors and how they achieved their performances. Though the piece often feels more than a little self-congratulatory, I do enjoy the shots from the recording studio. We also get quite a few nice insights into improvs and other performance elements. Not a Drop of Real Water breaks into three subdomains. We get “Surf Cam” (7:25), “Making Waves” (12:56) and “Storyboard to Surfboard” (1:59). “Cam” features Brannon, Buck, Heder, LaBeouf, Bader, co-producer Lydia Bottegoni, head of layout James Williams, CG supervisor Bert Van Brande, and production designer Paul Lasaine. It looks at the film’s camera work and how it achieved its documentary look. “Waves” includes Buck, Brannon, Jenkins, Bader, Machado, Slater, Bridges, LaBeouf, Bredow, Schaub, supervising animators Chad Stewart and Pete Nash, lighting technical director Darren Fisher, animators Jeff Schu and Dougg Williams, lead lighting artist Michael Sandrik, character setup supervisor Mike Ford, effects animation supervisor Matt Hausman, wave setup lead Erick Miller, and wave animation lead John Clark. “Waves” discusses the animation of the waves and all the issues that went into that area. Finally, “Surfboard” gives us a multiangle option. It lets you watch a part of the film via these choices: storyboards; rough layout; animation; feathers and fur; effects; final film; and a composite. We can also view a “progression reel” that shows all six in order of completion. For the final featurette, Meet the Penguins fills three minutes, 53 seconds and shows a couple of real penguins as they visit the production. Why? I have no idea, as they’re not used for reference material. It’s a cutesy program without much value. A Blu-ray exclusive, we find a Pinball Game. This lets you play a movie-themed arcade game via your remote. The disc says it’s optimized for Playstation 3 – which may be why response time stunk on my Panasonic player. If the game plays well on your machine, it might be fun, but I experienced such a bad delay between the time I pressed a button and the on-screen reaction that I didn’t enjoy it. Next we find five minutes, 19 seconds of Progression Reels. Bredow narrates as he leads us through the many components that go into various animation pieces. It’s a good examination of the effects elements in the movie. After this we get a music video for “Lose Myself” by Lauryn Hill. It’s a cheap video, as it just matches movie clips to the song. At least the tune’s not too bad, as it’s listenable in the “Hey Ya!” vein. Next we get two ChubbChubbs Shorts. 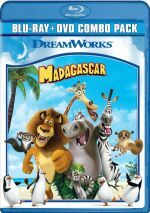 The first one – just called “The ChubbChubbs” – ran with Men in Black II and appeared on that disc as well as on its own. Since I already reviewed it in both places, I won’t say much here other than that it’s a clever and entertaining piece. Under Previews, we get ads for Open Season, Open Season 2, Monster House and RV. No trailer for Surf’s Up appears here. I didn’t expect much from yet another penguin movie, but Surf’s Up proves surprisingly winning. No, it reinvents no wheels and doesn’t ever become anything truly special, but it’s fun and entertaining. The Blu-ray provides good picture and audio as well as a nice selection of supplements. This becomes a fine release for an entertaining comedy.